Packing up for glass camp! Well, actually it is a beginning bead making/flameworking 2 day workshop at Playing With Fire, in Rockland, Maine. Last fall, after taking a workshop together from Celie Fago in Vermont, my good friend Holly Kellogg and I decided we would try to meet up again for another workshop. She lives in Connecticut and we have developed a really nice friendship over the years between our blogs and in seeing each other at conferences. If we’re lucky in life, we get to meet people who are extremely nice, talented, generous with their knowledge, and who have a similar warped sense of humor. Sometimes the connection is so strong that you would swear you were sisters in a different life. That’s who Holly is for me. I may end up hating glass as a medium, though that means I would have to dislike it more than paint. Or I could end up redesigning my basement studio to accommodate a bench for flame work. With the price of silver at $37.55 this afternoon, I have to believe glass is less expensive to work with. But what do I know? Nothing about glass. That’s why I’m off to glass camp today on the 4 p.m. boat. 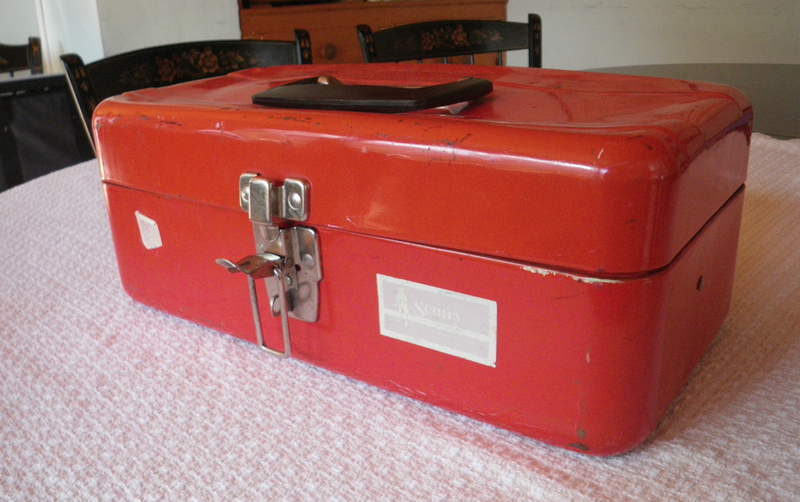 Th tool box goes with me to workshops, craft fairs, and just about any artistic endeavor. This time, I figure it won’t melt if I drop some hot glass on it. 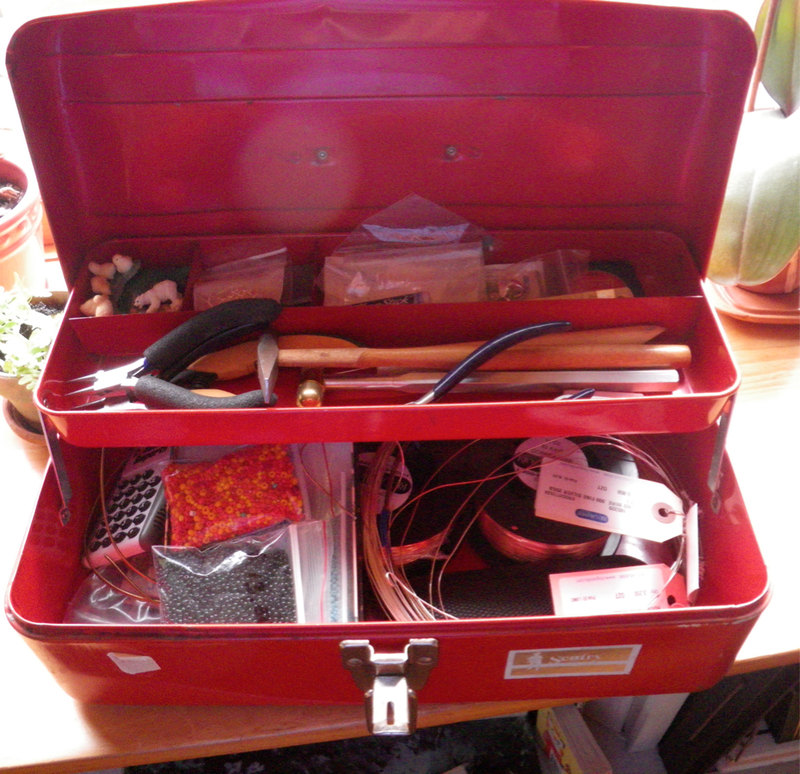 Tools I think I might need….or at least the ones I like to have with me whether I need them or not. This is something I keep in my tool box, always. 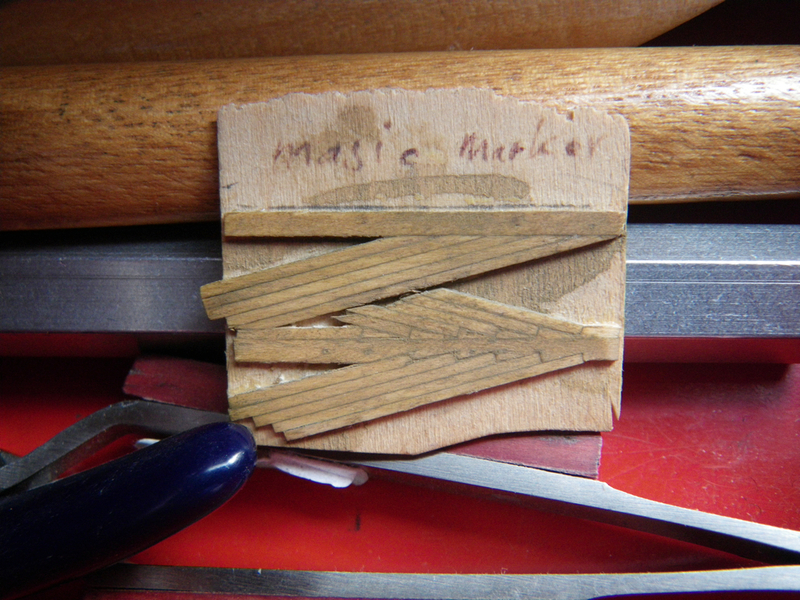 A little scrap of wood with sample stains for the deck of a ship model. My father was a model maker after he retired from Kodak, and he had bits like this all over his work bench. He passed away 15 years ago, but he always feels close when I grab my toolbox to head out on another artistic adventure. Love us creatures of habit!